A wonderful woman named Nancy and I connected (one of those divine appointments) and have enjoyed one another since! She wanted to have a Private Class for her friends! I love that she picked out some great Vintage style cards, stamps and colors!!! (The StampinUpLNStampers challenged torn cards this week, what a great fix!). Thisssss card was created to teach some techniques that would distress and make vintage a lovely card. I started with Certainly Celery, Pink Pirouette and the Color Coach suggested Soft Suede to go with these colors. I also used the Naturals White paper for the neutral. 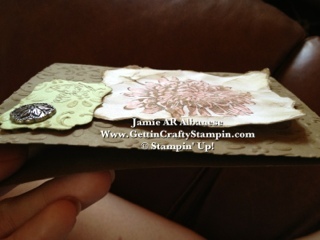 I used our Big Shot and an embossing folder and embossed the Soft Suede card base. I then took a Dauber in Soft Suede ink to add and highlight the dimension of the texture as well as lend more of a vintage feel. I then stamped my sentiment with Soft Suede ink on Certainly Celery paper and then did the same embossing and daubing/distressing. I used our Antique Brads to lend that vintage feel. The Decorative Label punch is a must for sentiments and looks sooo lovely! Dimensional adhesive allows for it to float on the base. 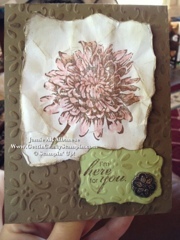 I then stamped the Flower from Blooming with Kindness in the Soft Suede ink on the Naturals White cardstock. 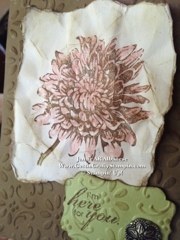 I then took the Pink Pirouette Stampin Write Marker to the flower. I left some of the Natural White cardstock peek through. I used the Certainly Celery Stampin Write marker for the stem. I ripped the cardstock on all sides and then crumpled the cardstock (go ahead, get all those aggressions out lol). 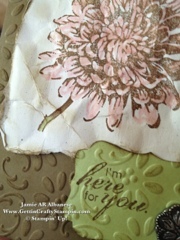 I then took the Dauber and the Soft Suede ink to the edges and the crumples, highlighting the distressed edges and look. I then used SNAIL adhesive to apply it to the card base. I then used my fingernails to curl the outer edges so the curled and waved about. 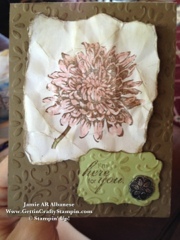 I love how this card came out, it was highly ranked with the ladies at the Private class. My hubby loved it, said it was very elegant (it's so sweet how he has opinions on allllll of my projects lol). Go, get your vintage on.... You maybe surprised at how it comes out!